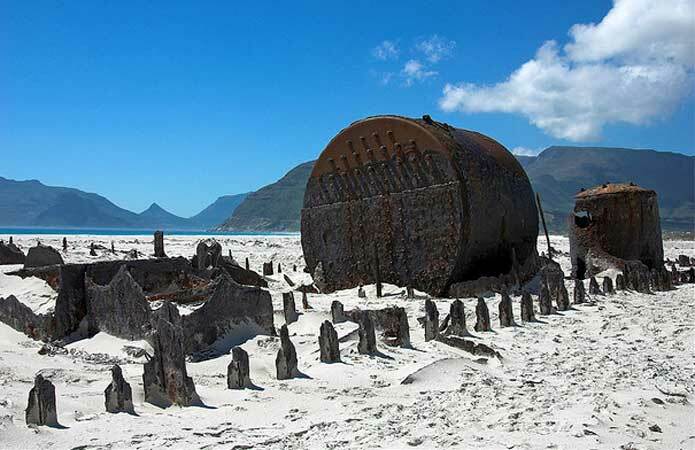 The Atlantic shoreof South Africa’s South Western Cape is littered with shipwrecks, each with a story to tell. The notorious storms and fog along these shores provide a common thread to most tales, as does the unique interplay between ocean currents and the hostile shoreline of reefs and cliffs. Add human error and there’s little surprise to learn that the potential number of shipwrecks along these shores is in the hundreds (South African Heritage Resource Agency maintains an inventory). Some 360 shipwrecks are recorded in Table Bay alone (source: MAP – Maritime Archaeological Project of Table Bay). The tale of the demise of the SS Kakapo on Noordhoek beach in May 1900 is as unusual as it is typical. The Kakapo is a well known landmark on the otherwise featureless 8km expanse of sand known as Noordhoek Beach. On a clear day, you can’t miss it as you travel south across Chapman’sPeak Drive from Hout Bay. The long stretch of Noordhoek’s beach comes into view as you descend into the valley – and there, about half way along, is the distant outline of a small ship buried in the sand. That in itself seems odd, since every other wreck along these shores lies on a reef or under water. Interestingly, film buffs may recognize this wreck, embellished with a funnel, in some of the scenes in the award-winning film Ryan’s Daughter (1970) starring Robert Mitchum and Trevor Howard. This Cape Town beach is popular with horseback riders and hikers, who can take the 40 minute hike from the car park to the Kakapo’s remains (boiler, keel, propeller screws and ribs). Just a word of warning to hikers: never hike alone and always ensure that your group consists of at least four adults. Sadly, robberies do occur along this serene but often deserted stretch of beach. The events leading to the SS Kakapo’s unfortunate demise began to unfold as the steamship left Cape Town harbour in the afternoon of May 25, 1900. The 665 ton schooner rigged steamship was sailing with coal ballast, from theUK to Sydney for delivery to its new owners, the Union Steam Ship Company of New Zealand. It is believed that this was Danish Captain Nicolayson’s first command, having received his captain’s ticket just months before. His course would take the Kakapo south, following the west coast of the Cape Peninsula and then east around Cape Point and Cape Agulhas, the southern tip of Africa. In 1900, navigation would depend heavily on charts, compass, sight of shore and lighthouses. The first light he would see would be the old Cape Point lighthouse, set high up on the Point and at times obscured by low cloud and fog. An onshore North-Westerly gale was picking up as the vessel steamed south. The Kakapa maintained her top speed of 9.5 knots, perhaps in haste to round the Point before sunset and ahead of the full onset of the storm. However the brunt of the storm soon bore down on the vessel, with huge seas, driving rain and near zero visibility. At sunset, with poor visibility, it appears that the captain caught a glimpse of Chapman’s Peak, north of Noordhoek. Believing that he had just sighted Cape Point, he ordered the helm to steer hard to port, maintaining full steam. It wasn’t long however when the bridge caught sight of breaking waves directly ahead. The full astern command would have little effect against the vessel’s forward momentum, the onshore gale and mountainous seas. The Kakapo ploughed up onto the sandy beach. The surge of heavy seas and tide would have shifted her even higher until the storm eventually subsided, leaving the Kakapo stranded. Not a soul was lost in the stranding of the vessel. Two members of the crew of twenty climbed down to the beach in the dark and went in search for help. They spotted the lights of a dairy farm and were able to summon help. The next morning, all hands were able to climb down onto the sand, hardly wetting their feet. A concerted attempt was made to refloat the ship, without success. She was firmly embedded in the sand. 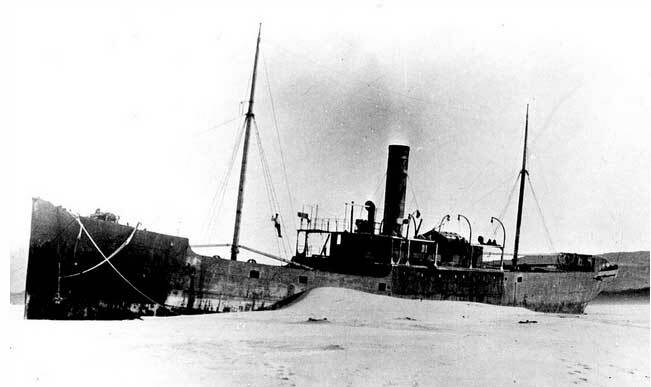 The Union Steam Ship Company lost its steamship before taking delivery and most of the steel of the superstructure and hull was eventually stripped for salvage. It’s reported that the captain was so mortified by the loss of his ship that he stayed on board, refusing to leave and refusing to talk to the crowd of amazed locals, reporters and officials. Legend is that he lived on board for three years, before eventually being escorted off the vessel and taken to a mental facility. Old photographs of the stranded steamship show the weathered and partly buried vessel with black smoke drifting from its stack. This entry was posted in African Shipwrecks, All about travel, Beaches of Africa, Top attractions, What is it? 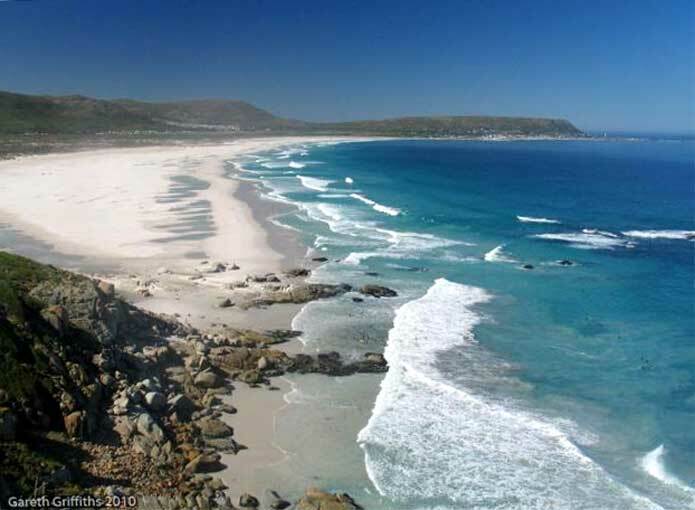 and tagged about cape town attractions, africa travel, African beaches, Cape Town beaches, Dive sights in South Africa, Horseriding in South Africa, Noordhoek Beach, Noordhoek Long Beach, Shipwrecks Africa, Shipwrecks of South Africa, south african beaches, SS Kakapo by Findtripinfo.com. Bookmark the permalink.